recently i have been having troubles with various CD players either loosing their FM tuners, or having the CD tray stop functioning. I finally opened up my stock radio and fixed the few cold solder joints, getting the head unit functional again. I have a two fold question I suppose, and though I searched around here, google, and s12silvia i turned up pretty much nothing related. 2. In light of the issue and the unlikely event that it can be fixed, i was wondering if anyone knew the pin out/in on the 5pin Din that the cassette deck uses to plug into the head unit? Is it a standard midi pin out, or a home audio/receiver pin out ? I tried testing my deck, but since i cant actually get a tape to play i cant determine whats the shared pin, or the left and right output pins. Just wondering since a number of cruiser type road bikes use a 5p Din input/output from their stock radios, there are adapter plugs that go right to a 3.5mm stereo jack to use a media player with them. It's been just over a year. Did you ever figure out anything on the pinouts? I've been thinking about wiring in an old portable CD player or making an iPod adapter. I now have this info. Can you share the cassette deck part numbers? Can you share said info? Not having to use a radio tuner style intercept to put my phone music onto the head unit would be great! I'm working on this and need some time to perform a few experiments first but that's the goal: iPod input to the factory radio. It would still be helpful to have the model number of the OEM cassette option. So finally today I did some experimenting with sending iPod signal into the OEM radio. I had the cassette deck option in my first S12. When the radio was on and a cassette was inserted the radio would mute and the power antenna would retract, then the cassette deck output was controlled through the head unit. Eject the tape and the radio signal would return, antenna would rise to its previous setting. Below is a scan from the OEM radio service manual. Now I'm not an electronics genius and have only basic schematic knowledge but I figured jumping pins 1 and 2 (see DIN connection at bottom left of image) would duplicate the condition of inserting a cassette; mute the radio and retract the antenna. If you look at the bottom left of the image you'll see a 5-pin DIN labeled "FOR DECK." Pins 1 and 2 appear to control voltage going into and coming from the cassette deck. Pin 3 is ground and pins 4 and 5 are L+R inputs. Simple, right? When I jumped 1 and 2 the antenna did indeed retract and the radio muted but there was no sound from my iPod when inserted on pins 4 and 5 from the headphone jack. I have been unable to reverse this and get radio sound or antenna control again. Before, simply ejecting the cassette restored normal radio but pulling the jumper did not restore radio. Have a read of the schematic. Anyone else have a different take? Do you also have a diagram of what those pins go to in the cassette unit? You would need to connect the signal ground too wouldn't you? Into pin 3? I agree, the signal ground should be your left and right channel grounds. I took this as understood but I had pin 3 connected to signal - when signal + was inserted into 4 and/or 5. I'm more concerned now with reversing the radio mute and restoring antenna function. I looked at it a little more and now I understand what you are saying. It looks like pin 2 is full power from the radio. Once the radio is turned on the deck is turned on. Pin 1 is your deck power. Once this signal is turned on then the deck should play. Just take the signal off of pin 1 and see what happens. Keep pin 2 connected. Also I know that iPods output at 1v max. This might not be enough to hear depending on what the voltage input is from the tape deck. If its looking for a 5v signal then you might have to turn the radio up all the way to hear something. I never did resolve the issue and ended up getting a Pioneer Head Unit to replace the stock ones. I had taken the stock radio apart like 10 times to clean contacts/tuning pots, fix cold solder joints, and most recently the LCD has started to bleed and its nearly unreadable. This "upgraded" model had a lot of issues and was recalled a few times by Nissan/Clarion. My car had the HU replaced in 1986, 1987, and 1989. The model that had the Cassette deck integrated in with a smaller internal amplifier seems to always work without issue, So maybe sourcing one of those is a better option if you wish to retain a factory look. The other result of this is as deuce said : it may be expecting higher input, and the few mV that goes from a standard PMP device is just not going to do much of anything. I never knew there were 5 pin DIN to 3.5mm cables so I began searching. Seems to me the 5 pin arrangement on all the cables I see is different than on the Clarion head. Moreover, the pins look much fatter but it's hard to tell just by pictures. Maybe one day a cassette unit with a decent faceplate will turn up. My "Loud" button and display don't work on my Clarion unit, so I was planning on pulling that out again soon to see if I can find a fix. I'll pick up one of these cables and see if I can make some noise. Keslo, did you have any success with the cable from amazon? I acquired another radio and a remote cassette player but both also have issues so I've determined to get at least one radio professionally repaired. Across the web I've found many radio repair businesses but there seems to be a gap in the work they do. Many "vintage" car radio shops work on units from the 30's to 1979 when pushbutton radios were phased out. And some only seem to work on more modern head units perhaps including navigation systems, back-up cameras, etc., but there's a gap in the 80's where we're left out. Typical of an S12, eh? I've written to several and received replies of, "sorry, we don't work on those and don't know who does." Anyone know of a radio repair shop that will work on Clarion/Nissan OEM radios for the S12? I must say I found one in Richmond, VA that has several business names all feeding to the same store, Southern Electronics, but I thought their price was crazy. Any others around? Someone recently (past year or so) posted about a shop out in CA that would refurbish our stereo cassettes, so try searching for that. They were very happy with the repairs. I had this page saved- don't know where I originally saw it bu maybe can help? 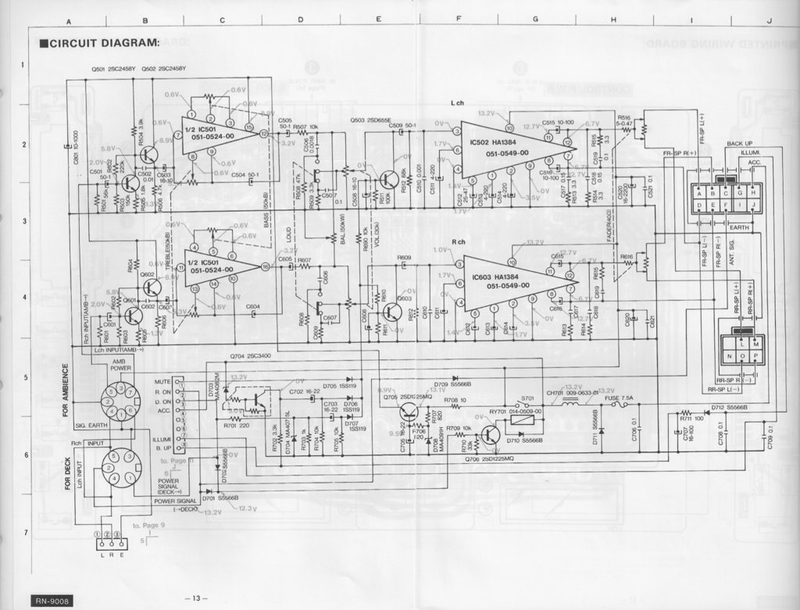 Download link for OEM Clarion AM/FM radio model RN-9008 factory service manual.